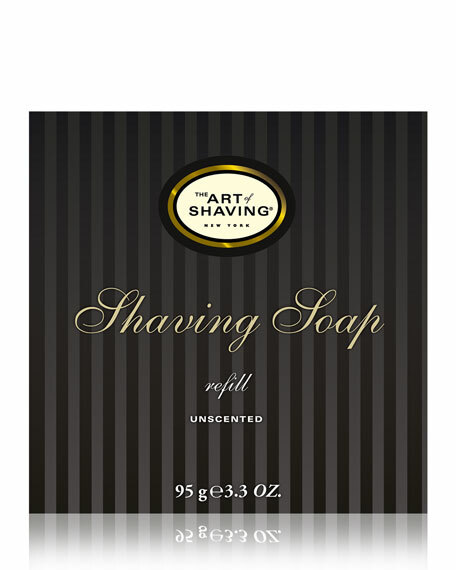 For the traditional wet shaving experience, The Art of Shaving offers their classic Shaving Soaps. Formulated with glycerin and coconut oil, they generate a rich lather when used with a shaving brush (sold separately) and hot water. The lather protects the skin and softens the beard while providing an extremely close shave. How to Use: Always shave during or after a hot shower. Wet a Badger Shaving Brush with hot water and whisk it over the surface of the soap to generate a rich lather. Apply lather on the face and shave with the grain. For a closer shave, re-lather and shave lightly across or against the grain. Rinse with cold water and apply After-Shave Balm. Founded in 1996, The Art of Shaving is considered the world's leading premium shaving brand with its aromatherapy based grooming products, high-end shaving instruments, and a retail chain dedicated to men's shaving. The Art of Shaving has trademarked its wet shaving system "The 4 Elements of the Perfect Shave"-Prepare, Lather Up, Shave, and Moisturize -and is recognized as the best-selling men's brand. The company, which was started in a kitchen, is now a worldwide organization still nurtured by the founders' talent and passion. They have succeeded in creating a brand with a mission, one that promises to be a household name for generations to come. For in-store inquiries, use sku #287363.